Barbara Hepworth (specifically Jocelyn Barbara Hepworth) was born on January 10, 1903, in Wakefield, England. Hailed as one of the most important female artists of the twentieth century Hepworth first studied art in Leeds, where she met and later became friends with Henry Moore. 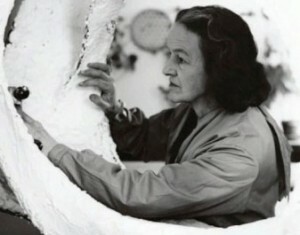 After completing her studies in Leeds, Hepworth went to the Royal College of Art in London to become a sculptor. She participated in both the first and second “documenta” exhibitions in Kassel, in 1955 and 1959 respectively. Hepworth died on May 20, 1975, in a tragic fire in her home at St. Ives, Cornwall. The house is now a museum and features many of her works.